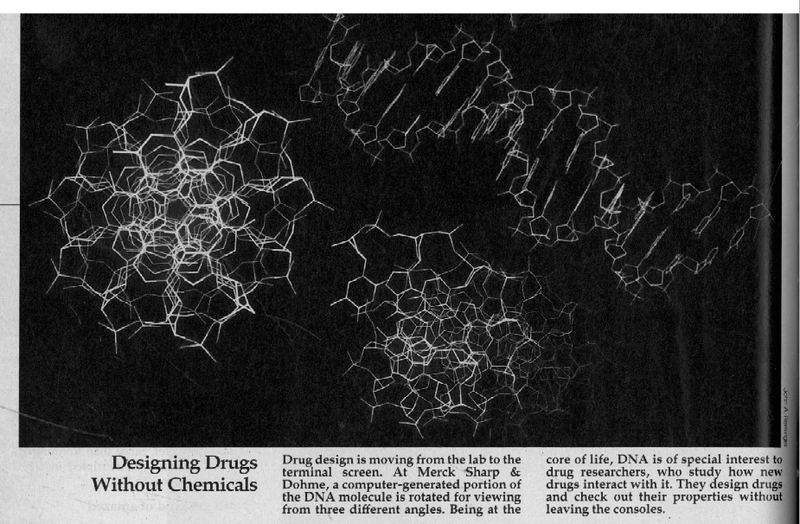 The Curious Wavefunction: "Designing drugs without chemicals"
As usual Derek beat me to highlighting this rather alarming picture from an October 5, 1981 issue of Fortune magazine that I posted on Twitter yesterday. The image is from an article about computer-aided design and it looks both like a major communications failure (chemical-free drugs, anyone?) as well as a massive dollop of hype about computer-aided drug design. In fact the article has been cited by drug designers themselves as an example of the famous hype curve, with 1981 representing the peak of inflated expectations. For anyone who wants the exact reference it's the Fortune magazine issue from Oct 5, 1981. The reference is widely considered to be both the time when CADD came to the attention of the masses, as well as a classic lesson in hype. The article itself is really odd since most of it is about computer-aided design in the industrial, construction and aeronautical fields; these are fields where the tools have actually worked exceedingly well. The part about drug design was almost a throwaway with almost no explanation in the text. Another way to look at the issue is to consider a presentation by Peter Goodford in 1989 (cited in a highly readable perspective by John van Drie (J Comput Aided Mol Des (2007) 21:591–601) in which he laid out the major problems in molecular modeling - things like including water, building homology models, calculating conformational changes, predicting solubility, predicting x-ray conformations etc. What's interesting is that - aside from homology modeling and x-ray conformations - we are struggling with the exact same problems today as we were in the 80s. That doesn't mean we haven't made any progress though. Far from it in fact. Even though many of these problems are still unsolved on a general level, the number of successful specific examples is on the rise so at some point we should be able to derive a few general principles. In addition we have made a huge amount of progress in understanding the issues, dissecting the various operational factors and in building up a solid database of results. Fields like homology modeling have actually seen very significant advances, although that's as much because of the rise of the PDB which was enabled through crystallography as accurate sequence comparison and threading algorithms. We are also now aware of the level of validation that our results need to have for everyone to take them seriously. Journals are implementing new standards for reproducibility and knowledge of the right statistical validation techniques is becoming more widespread; as Feynman warned us, hopefully this will stop us from fooling ourselves. As you mention however, the disproportionate growth of hardware and processing power relative to our understanding of the basic physics of drug-protein interaction has led to an illusion of understanding and control. For instance it's quite true that no amount of simulation time and smart algorithms will help us if the underlying force fields are inaccurate and ill-tested. Thus you can beat every motion out of a protein until the cows come home and you still might not get accurate binding energies. That being said, we also have to realize that every method's success needs to be judged in terms of a particular context and scale. For instance an MD simulation on a GPCR might get some of the conformational details of specific residues wrong but may still help us rationalize large-scale motions that can be compared with experimental parameters. Some of the more unproductive criticism in the field has come from people who have the wrong expectations from a particular method to begin with. Personally I am quite optimistic with the progress we have made. Computational drug design has actually followed the classic Gartner Hype curve, and it's only in the 2000s that we have reached that cherished plateau of realistic expectations. The hope is that at the very least this plateau will have a small but consistent positive slope. Y Combinator and biotech: The wave of the future?